You may remember that I featured one of the beautiful flower bottles from Dartington Crystal in my column in Wedding Flowers magazine recently? Well, today’s post shows all of the range. Aren’t they just lovely…and such beautiful colours. Each bottle is embellished with its own flower motif and their names range from Primrose Blue to Daisy, Pansy and Anemone. 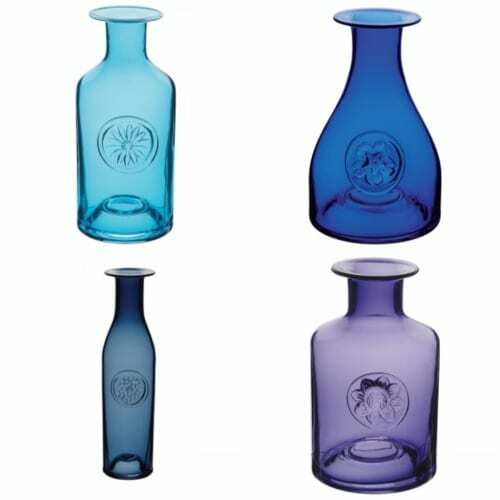 The bottles were designed by Hilary Green, who leads the Design Team at Dartington Crystal and the range won The Giftware Association’s Gift Of The Year Competition in 2009. Dartington Crystal is a name which I grew up with as I was born in South Devon, but I never realised that the company started in 1967 when a group of Swedish glassmakers brought their hand-making skills to rural North Devon to help start the company!